Diagnostic ultrasound is one of our primarily specializations, and we would love to have the opportunity of helping you determine the best ultrasound solution for your practice. Try us! Call us now at 800-839-0722. We can answer your questions and help you make the best choice of a new ultrasound. Comparing Us With Other Ultrasound Dealers? 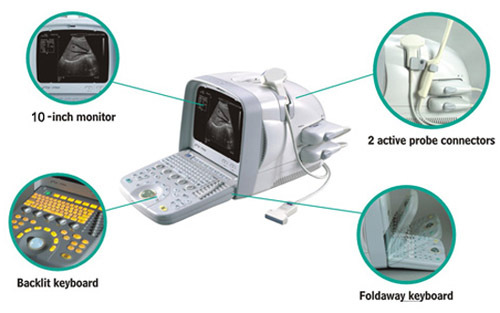 The CTS-7700+ Ultrasound from SIUI, with its wide-range of available probes and its arsenal of built-in calculation packages and available upgrades, is our top portable black and white system. 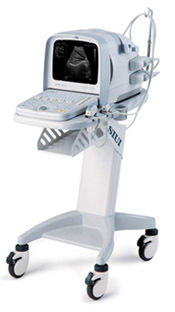 Perfect for a variety of applications, from Urology and OBGYN exams, to high-frequency musculoskeltal Spinal imaging and highly effective Foot and Ankle work, the CTS-7700+ combines exceptional ease-of-operation with high-performance imaging at a still-affordable price — which is probably why our clients all fall in love with it from the very first day. Unlike the CTS-5500 with its UNIX core, the CTS-7700+ operates on a Windows-based solftware platform. You only see Windows at the start-up, but it is Windows running in the background, and is this platform that makes possible several available upgrades, including the OBGYN 3-D package and the DICOM 3.0 communications package. 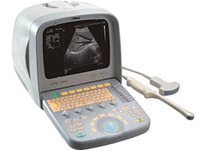 Like the CTS-5500, the CTS-7700+ is upgradeable, meaning that as upgrades are released (free to Fisher Biomedical clients), your ultrasound simply becomes better and better. The CTS-7700+ has an excellent array of image-management functions, which will enable you to not only make all of your measurements and annotations quickly and efficiently, but also allowing you to save images either internally or externally (to a USB thumb drive), in a variety of file formats (including the popular .jpg format for saving your captured and annotated images, and even the .avi format for saving your entire cineloop as a video file). What contributes most to the image quality on the CTS-7700+? The more information you include, the better we are able to recommend an ultrasound package ideal for your needs. Will you also need training? Are there any other models you are also considering? Fill out this short form and tell us a little of what you will be using the ultrasound for primarily. Family owned and operated for over 25 years, Fisher Bio-medical specializes in consulting with clients on their diagnostic ultrasound needs, having worked with doctors and sonographers, hospitals, veterinary practices, colleges and universities, medical centers and government agencies — across the USA.